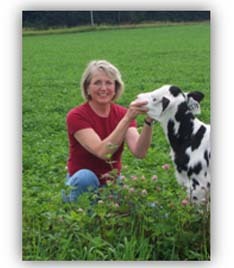 Cris Peterson, along with her husband Gary and son Ben, operates Four Cubs Farm, a dairy farm in Grantsburg, Wisconsin. Born and raised in Minneapolis, Cris earned a B.S. in Education from the University of Minnesota, before marrying Gary and moving to the farm. Cris’ writing career began when she gave mouth-to-mouth resuscitation to a new born calf and knew it would make a great story. The calf, named Breathless, survived and the story did sell. Since that unusual experience, farming and writing have become her dual careers. When she’s not milking cows, feeding calves or staring at her computer screen, her favorite thing to do is speak to kids in schools and to parents and others about literacy and agriculture. Her goal in writing books about farming is to create a sense of wonder … the “Wow, I didn’t know that” reaction that connects with her readers. Extra Cheese, Please! was her first book which was published in 1994. To date, more than 100,000 of her books have sold nationwide and garnered several state and regional awards. For eight years Cris wrote a national syndicated newspaper column reviewing children’s books, appearing in the Chicago Tribune, St. Paul Pioneer Press, Dallas Morning News, Atlanta Constitution and the Sacramento Bee. Features have appeared in The Chicago Tribune, Atlanta Constitution, Milwaukee Journal and the St. Louis Post-Dispatch. Articles and stories have been published in magazines including Highlights for Children, Cricket, Cooperative Partners, Hoard’s Dairyman and many others.